100 donors, including royalty, and supporters of the D’Andre D. Lampkin Foundation gathered for the Lampkin Foundation’s annual Social Good Benefit Gala. ONTARIO, CALIFORNIA, UNITED STATES, October 26, 2018 /EINPresswire.com/ -- On Friday, September 28, 2018, approximately 100 donors and supporters of the D’Andre D. Lampkin Foundation gathered for the Lampkin Foundation’s annual Social Good Benefit Gala. The red carpet event took place at the 100 year old historic Beverly Hotel (now Beverly Banquets) located in Ontario, California. One hundred percent of the proceeds benefited the programs and initiatives designed to support education, economic development, climate change research, health and wellness, and healthy alternatives for underserved communities. European Royal, Prince Mario-Max Schaumburg-Lippe hosted the benefit gala. Board Member Marcellus McMillian opened the evening with an invocation and thanked the many supporters and sponsors of the Gala. Personal perspectives on the Foundation were then offered by two recipients of the Lampkin Foundation Social Good Scholarship: Allison Green and Sarina McCabe who is currently attending Emory University. Attendees were also addressed via video message by Dr. Alison Thompson, a D’Andre D. Lampkin Foundation supporter, donor partner, and full time global humanitarian volunteer who had partnered with the Foundation during its 2017 Power to Puerto Rico campaign. Thompson recounted how she first met D’Andre Lampkin in August 2017 following Hurricane Maria making landfall in Puerto Rico. The Lampkin Foundation coordinated the delivery of donations, such as clothing, and purchased 1500 units of solar power to be used in Puerto Rico to light roads and homes in the village areas. Dr. Thompson most fondly told the audience that the Lampkin Foundation has and continues to be about focusing on people, believing in humans, and showing love and compassion to everyone. 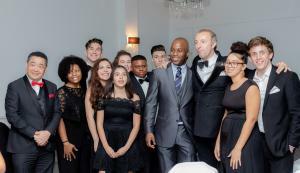 The D’Andre D. Lampkin Foundation’s annual Social Good Benefit Gala raised more than $19,800 for its causes, publications and various programs. This includes $9,500 in sponsorship provided by Beverly Banquets, The O’Steen Group, Galleano Winery, and Care Staffing Professionals. The D’Andre D. Lampkin Foundation is a 501(c)(3) charitable organization operating programs throughout California that have a significant impact in a wide range of issue areas, including education, economic development, climate change research, health and wellness, and providing healthy alternatives for under-served communities.